Finding the roof leak – The source of the leak is often a mystery, since drips or water stains may have their beginnings some distance away. Most often, rain gets through poorly sealed or corroded flashing around roof vents, chimneys or skylights, or along the intersection of roof planes. It can also get in when a nail becomes loose or a shingle gets broken. The water then flows down sheathing, rafters, and the topside of ceilings until it reaches a low spot where it drips or pools. To find out where the leak is originating, carefully enter your attic space during the day and use a flashlight to search for the spot where you noticed the drip. Follow any dampness as far as you can, or if the weather has been dry, look for water marks or discolorations. Switch off the flashlight and see if you can tell where light is shining through the hole in the roof. If it’s raining, see where the water is coming through the roof, and place a bucket under it. Another way to try to visibly locate the leak is to have one person go up on the roof and methodically hose it down while another person is in the attic watching for the water to come through. When the source is located, stick a nail into the hole and mark it with chalk or temporary marking paint both inside and outside so it can be found again and repaired. Shingle roof – Lift up the damaged shingle, and slip a sheet of sheet metal flashing up under the shingle so that the sheet metal covers the hole. You may need to pry up some of the roofing nails above the damaged shingle, so that the flashing is all the way up under the shingle above the leak and can then shed water. Metal roof – Seal up the leak with urethane roof cement. Use a putty knife to spread it over the hole or damaged area. Alternatively, use a self-stick waterproof flashing membrane. 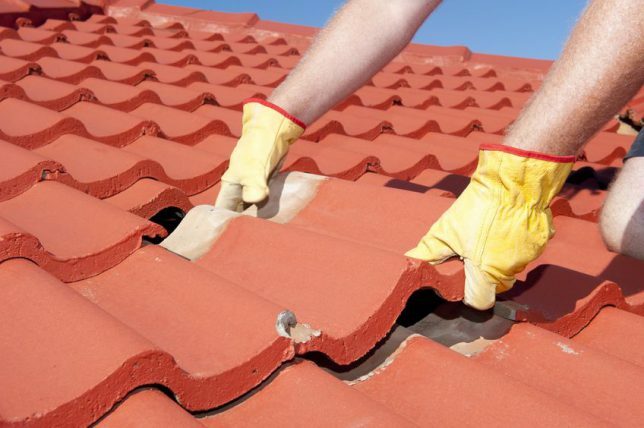 Tile roof – One of the most common causes of leaks in a tile roof is a cracked tile. To repair the crack, scrub the area with a wire brush, then fill the crack with plastic roofing cement to seal or join the crack. Call a professional roofing contractor. Keep in mind that working on a roof can be a dangerous job, especially for homeowners who don’t have the safety equipment that professional roofing contractors always use. For expert repairs, Contractor Connection puts you in touch with an experienced, prequalified roofing contractor whose credentials, licensing, and insurance have already been checked. To find a pro in your area, simply enter your ZIP code above for your free, no-obligation estimate.